Woman Talking Hi, I'm Noelle Parks interior designer and welcome to Dunn-Edwards paints how to paint video series. Choosing paint colors for your home can be quite a challenge while you may feel overwhelmed with so many color choices that you don't even know where to begin starting. 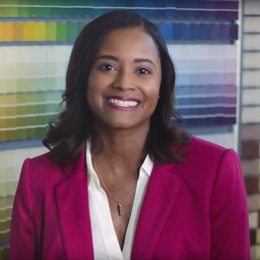 With some basic color concepts will help you find the right color in this video, we'll share tips for selecting the perfect color that's right for you in your space. First let's take a look at the psychology of color and how you can use it to make color selection easier. When looking at a color palette there are warm tones and cool tones throughout the palette. Warm and cool tones evoke certain moods in a room that are good basic rules to consider when choosing color. Warm tones include reds oranges and yellows. These colors are energetic playful and full of action and life. Images of interior house Red's the hottest of the warm tones is the most passionate of all colors. Orange is a conversation color it's used a lot in kitchens and dining areas. Yellow a bright and cheerful color can liven up the dullest room. Now cool tones are the opposite of warm tones. These colors inspire relaxation and meditation, they include greens, blues, indigos and violets. Images of interior house Green the color of nature is a calming cool color great for bedrooms and baths. Blue my favorite color and the color of the ocean brings out thoughts of spas and calming places. Purple and indigo are more spiritual and thoughtful these hues are great for meditation rooms. White represents purity peace and intellect use in proportion to other elements in a room. It's great for office spaces and areas where you need to think. Blacks and Browns are grounding colors these colors are used in various shades throughout the home. Woman Talking Now let's look at the function of the room when choosing color. Most homes have the basic rooms we are all used to like living rooms or family rooms dining rooms and kitchens or bedrooms and bathrooms and some larger homes have offices a number of concepts apply to color selection for many different reasons your decision to work to a color palette dominated by warm cool or neutral tones can be influenced by several factors for example the climate where you live warm colors are generally more acceptable in cold climates and cooler colors in warmer regions also the orientation of your windows a south-facing orientation will suggest a cool to neutral color preference while a northern orientations suggest the use of a warmer color. activity is another factor warmer colors tend to favor activity and stimulation while neutral and cooler colors favor calm and contemplation these effects increase a proportion to the intensity of the color use individual preference is another important influence to rooms used by one person will most likely show that person's particular taste while rooms used by several people need to meet the needs of a variety of preferences so many people may stay away from intense colors in these rooms remember these are general tips not hard and fast rules to live by have fun choosing color and go with your instincts. Now consider some of these basic rules to start confidently building your color palette rule number one do your research look at magazines pull paint swatches and match the colors for all the existing pieces in your homes from your artwork rugs sofas fabrics and drapery you'll want to determine what features are already in your room that you will consider permanent, for example look at the floors cabinets tile window treatments and any large pieces of furniture note the main colors that exist in these features and use them as a guide. Dunn-Edwards Website Dunn-Edwards also offers an online color tool called explore the perfect palette which allows you to create and save your favorite color schemes you can even apply colors to a photo of an interior to see how the color will look in an actual setting and once you've selected your color you can order color chips online. Woman Talking Rule number 2 look at the lighting in your room many times in choosing the correct shade of color lighting is the deciding factor if a room gets little natural light you may want to lighten up the room and paint it a light cool color. If a room gets a lot of sun and you want to make the room more serene consider painting it a deeper richer color. Rule number three don't assume that the color on the paint chips will look the same on your walls, also don't assume that the color that you see in your friend's home will look the same in yours. You may have different lighting, flooring, furnishings and also consider the all the architectural details. Rule number four, be sure to test the paint samples will, live with the color on the wall before committing to a full room of the color. Visit your neighborhood Dunn-Edwards paint store and select from hundreds of color chips that are in the color range that you want. Don't limit yourself to one or two as they may look different. Once you take them home, once you pare down your color choices you'll want to select at least three to four colors in that same range to test the paint before you paint the entire room. So now we're getting ready to paint this room so I brought this little guy the Dunn-Edwards 8 ounce perfect palette sampler. It's a perfect amount that you need in order to see exactly how the colors you selected will look before you begin painting. Woman Painting Wall Each time sample covers about a 4 foot by 4 foot area with two coats of paint. Paint a 2 foot by 2 foot sample area of each color on your wall, be sure to use at least two coats of paint to ensure the best color and then live with the color for a few days to see how it looks and feels at different times of day and at night. See how the lighting in your house and all the surrounding colors affect your color choices. Does one appeal to you more than another? Woman Talking Next step get inspired. Inspiration is personal to each of us in our homes, it can come from anywhere such as your art collections, draperies, a favorite area rug or even magazines. Lastly remember the colors fun to learn more about paint and painting watch the other how to paint videos on dunnedwards.com/videos. For Dunn-Edwards paints I'm Noelle parks thanks for watching and happy painting.